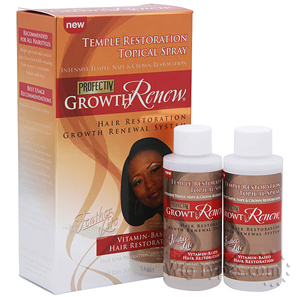 Profectiv Growth Renew Temple Restoration Topical Spray 4 oz. Intensive temple, nape And crown restoration. Hair Restoration Growth Renewal System Delivers directly to Temple and Crown area the maximum follicle, deep root stimulation to enhance natural growth. Regular use helps: -re-energize the hair root -restores scalp moisture balance -strengthen the hair shaft -renew delivery of vital nutrients to hair follicle This topical spray helps protect against reversible causes of hair loss and slow growth, while helping to reverse years of hair damage and resulting hair loss.